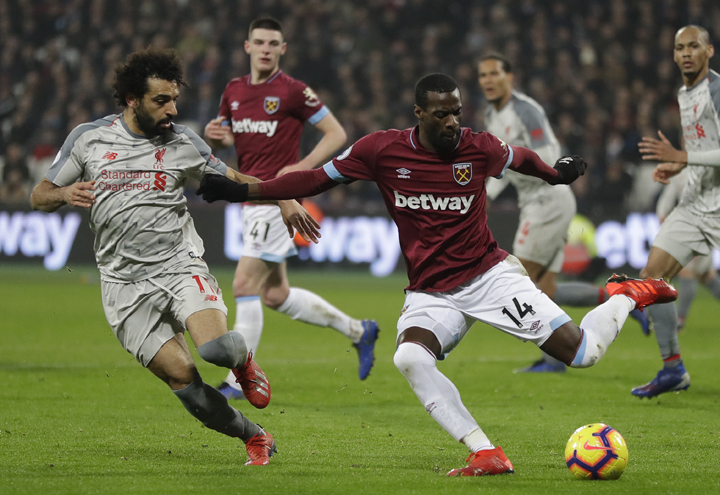 Liverpool\'s Mohamed Salah (left) and West Ham\'s Pedro Obiang challenge for the ball during the English Premier League soccer match between West Ham United and Liverpool at the London Stadium in London on Monday. With points dropped for the second consecutive game and a title challenge getting jittery, Liverpool manager Juergen Klopp is keen to transmit serenity. But a Liverpool lineup devoid of much attacking flair did rely on the referee missing a clear offside - and having no access to video review - to score its goal.